What The World Series and jet lag have In common? Well I can share with you that last night after enjoying one of the most exciting baseball games ever, and along side a few of my fellow friends we paid a price. That cost came in the form of less sleep. Personally I felt as though I just walked off the airplane from a long trip. It was game 6 of the World Series between the St. Louis Cardinals and the Texas Rangers and what is arguably one of the greatest series games ever played and it ended after midnight. I had been posting and tweeting on Facebook and Twitter sharing the ups and downs of the game with all who were willing. 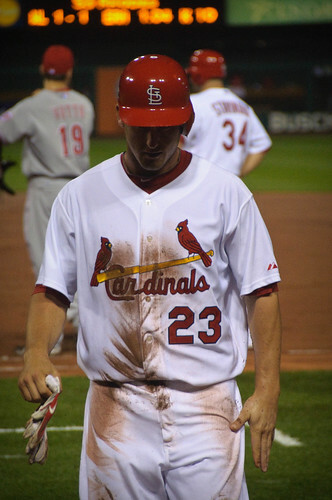 It was in the 11th inning and David Freese took a 3-2 pitch and drove it to deep center field to break the 9-9 tie game with one of the most exciting happenings in baseball a walk off home run. It was crazy an my online celebration continued well after the game we were all to excited to go to sleep. The next morning the walls were buzzing on my social networks. Everyone was chatting about their lack of sleep. Some joked about taking role call while others said they felt like the lack of sleep resembled jet lag, a feeling that our beloved Cardinals share all too often I’m sure and especially during this years World Series. This got me to thinking about today’s blog having to do with a recent new study that was released that seem to explain the feeling jet lag we all experience when we travel. Have you ever traveled from west to east? Well the jet lag we experience and the Differences we feel when traveling seems to be the responsibility within our brains. This feeling is actually a big disruption of our circadian clocks. Forget the alarm clock that wakes you in the morning, this is a clock in your body that sets itself and is believed to be the primary reason we experience jet lag. It often affects people more so when they’re flight takes them west to east, as apposed to the opposite direction and seems to have been solidified in a recent new animal study. Our circadian clock makes necessary regular adjustments to stay in sync light cycles of day and night. The circadian clock does this by advancing or delaying its time clock in reaction to light. These corrections usually happen with no notice. When this routine is interrupted by rapid light and dark changes in the light-dark cycle, in particular when we travel or take a long flight. Previous studies show delaying or advancing the brains clock occurs in altered pathways in an area of the human brain called the suprachiasmatic nucleus. This newest study has indicated that the molecular mechanisms within these brain pathways are considerably different. Science has known for years that within humans and other living organisms, advances are harder to achieve than delays. One of the best examples of this, compare the jet lag experienced in a trip coming from Europe back to the USA, Associate professor of biology Horacio de la Iglesia, from the University of Washington, said in a university news release. “One of the reasons may be that these two forms of resetting the clock involve different molecular mechanisms at the clock level,” he suggested. According to the researchers scientific findings from studies that included hamsters looks to help in efforts and help develop possible remedies related to jet lag, according to the researchers. The study was published online recently in the Proceedings of the National Academy of Sciences.